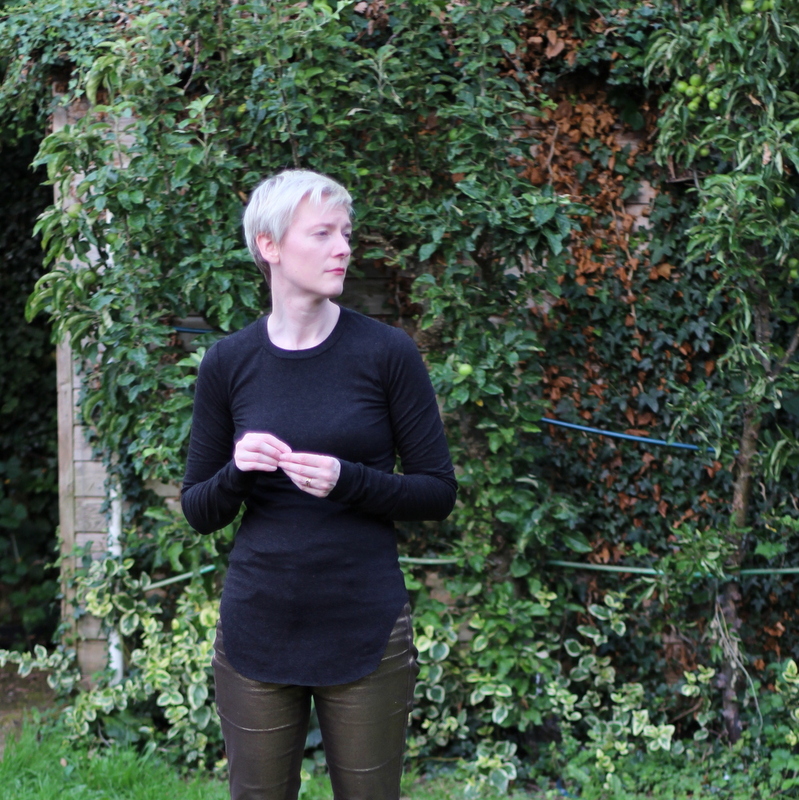 I usually blog about projects very soon after I’ve finished them; often before I’ve worn the garment in ‘real life’. 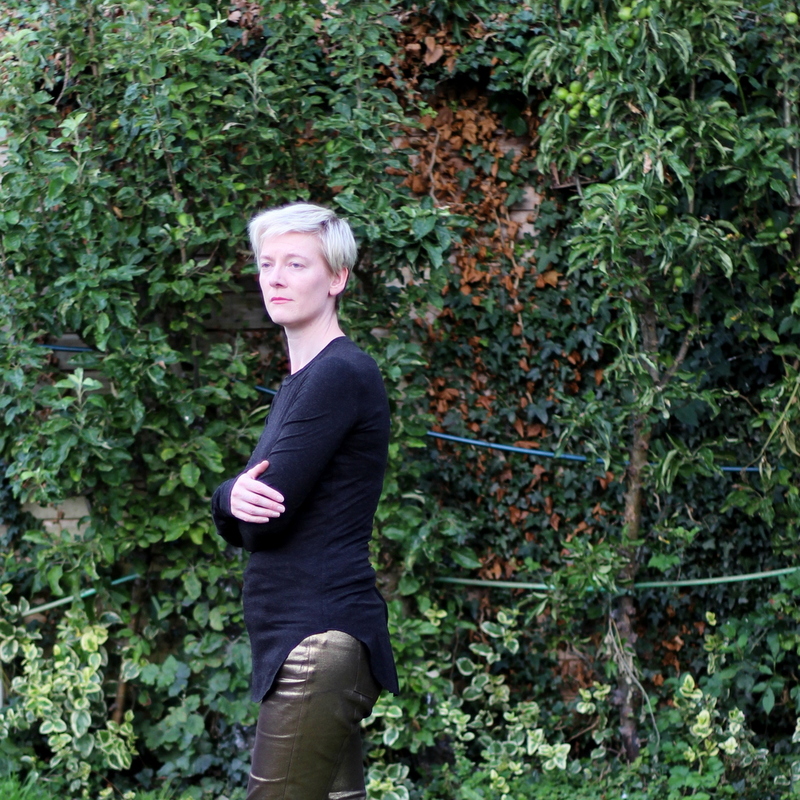 These trousers are an exception I finished them a couple of weeks ago and have lost count of the number of wears they’ve had. They’re one of my current favourites. And yet, when I come to look at the photos, they just aren’t quite right. The pattern is my tweaked version of Burda 103-07-2010, which I’ve made many times before. They are jeans style trousers with the side seams shifted a long way forward and a section seam down the back of the leg. I have lowered the rise about 5cm from the original pattern, and added a bit around the hips. The fit is all kinds of wrong and has been in every version I’ve made. Lots of excess fabric under the bum and the legs are too long. 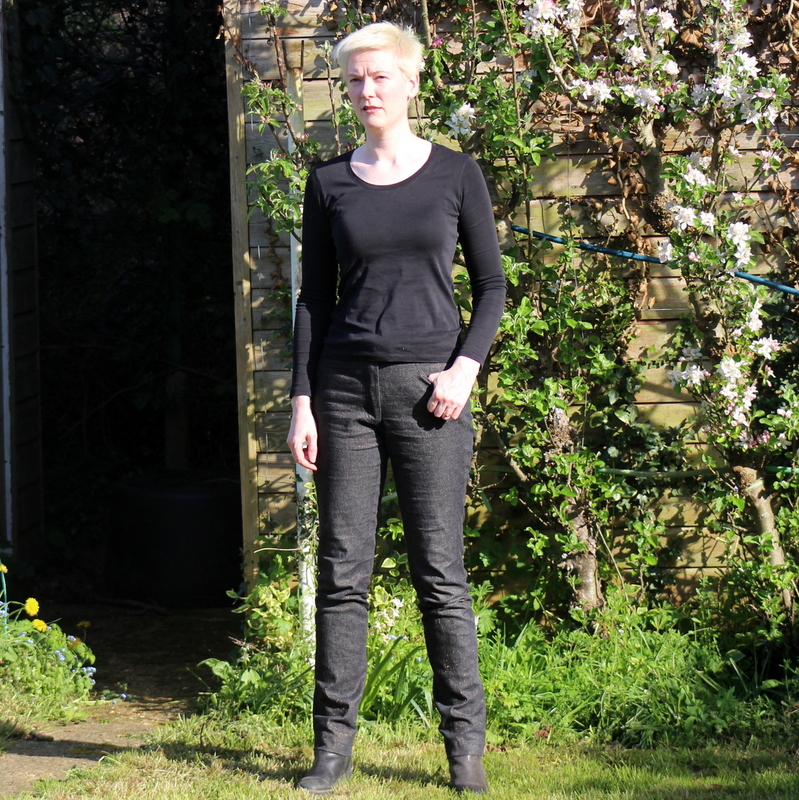 I am forever cursed to make trousers that are too long because of years of not being able to find RTW with sleeves and legs long enough. I’m so afraid of cutting anything too short that I always end up erring on the other side. 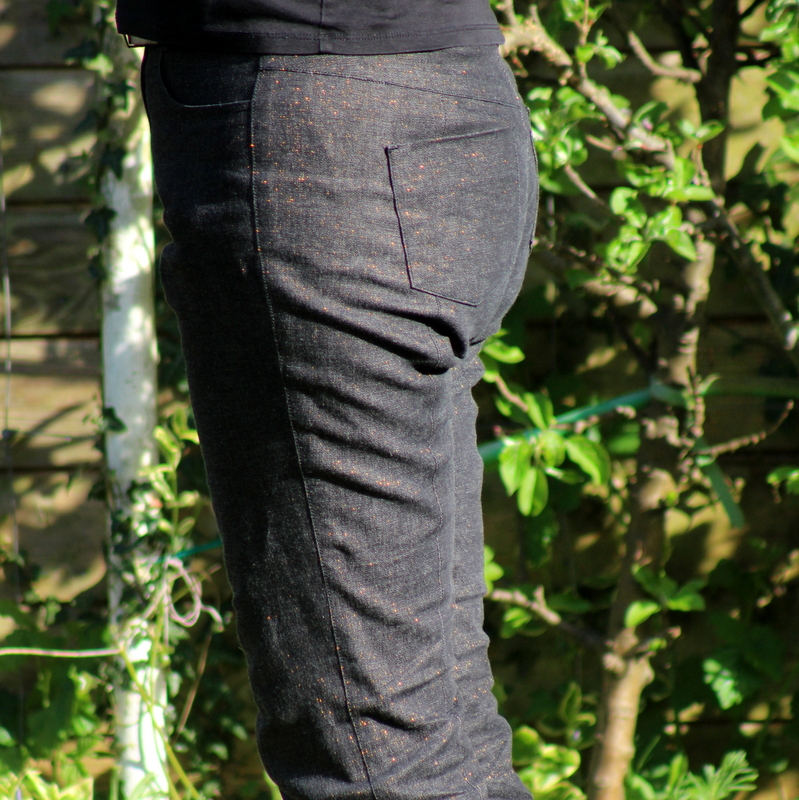 The fabric is unusual: a blackish stretch denim with some dark gold metallic threads. Unfortunately the metallic threads are a bit irritating to the skin so I always have to wear leggings underneath these, but it was easier to sew with than many metallic fabrics I’ve tried. It washed beautifully and didn’t mind being pressed even on a high heat. 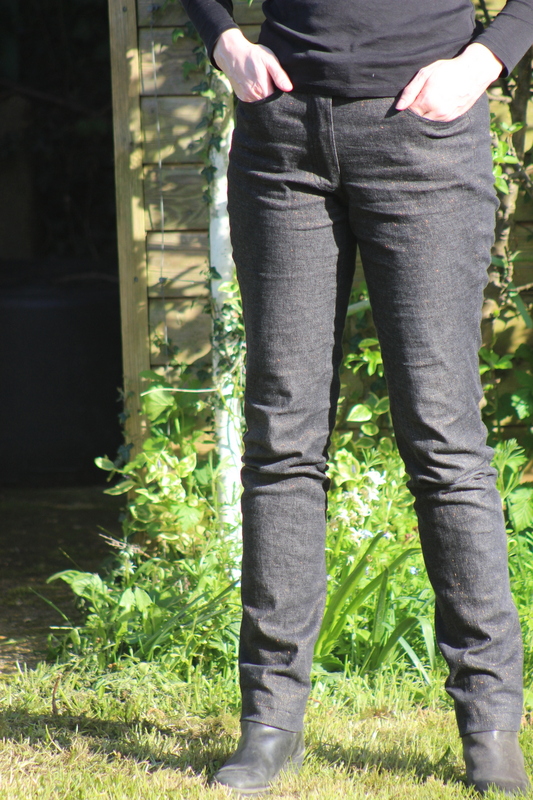 The fabric was unusually narrow for denim and I needed every scrap of two metres to make these. I bought it on Goldhawk Road last year. The sparkle is fairly subtle in real life; these pictures were taken in glaring sunlight. The fly front on these gave me no end of trouble. I’d shortened the rise on the original pattern, but I think I must have forgotten that when I consulted Burda’s instructions to find out what length zip to buy. The zip is far too long and that led to me ripping out the fly and restitching it some ridiculous number of times. I don’t notice it when I’m wearing it but you can probably see it’s out of proportion in the picture below. So they were massively aggravating to sew, they don’t fit right, and if I’m honest they’re not exactly the most flattering pair of trousers I own. I don’t think the unusual side seam position is doing me any favours. But I suspect I’ll carry on wearing them a lot; they’re comfortable and practical. 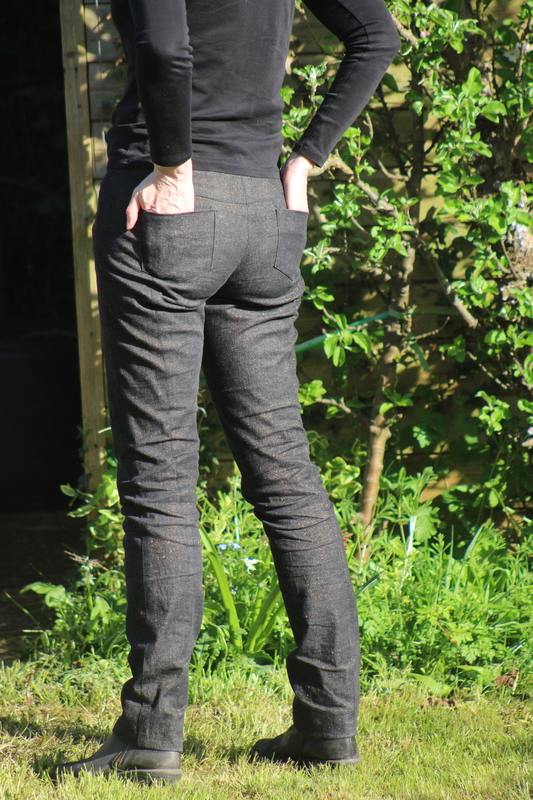 I think it might be time to move on from this pattern at last and try one of the many other Burda options for slim trousers next time though. This Burda pattern has been on my to-sew list for a long while. It’s 120-01-2012, a short trapeze-line design. This is a pattern that I was drawn to the moment I saw it, but put off making because of a fear that the trapeze shape wouldn’t work on me. Here’s the line drawing. The dress has a tiny yoke with a very high neckline attached to a six-panel a-line dress body. 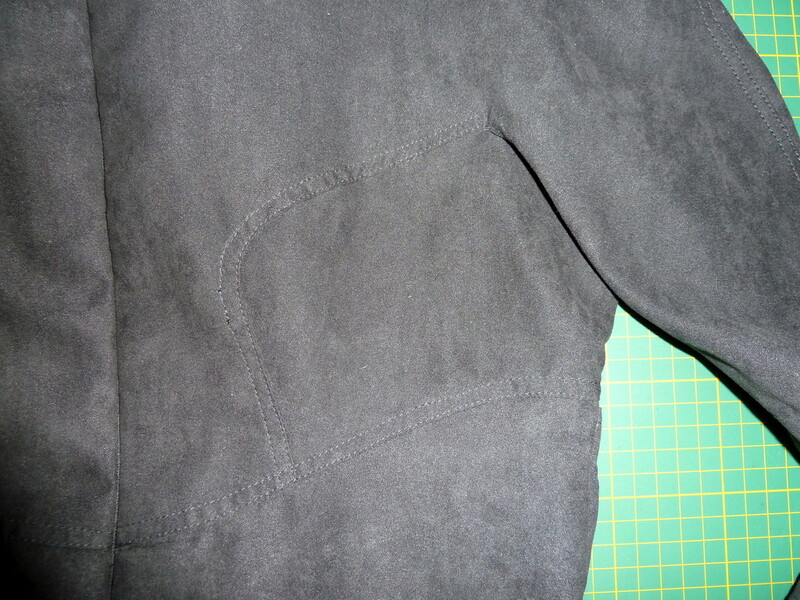 There are invisible zips in the right shoulder and side seams and side seam pockets. The fabric is a poly brocade from Minerva Crafts. At the time of writing it’s still available here. It’s quite floppy so I underlined it with poly organza. I also lined the entire dress, partly to help with maintaining the a-line shape, and partly to get an easy clean finish on the lower armscyes. The original version only has the yoke lined. You are supposed to finish the lower armscye with self fabric bias tape. I have no faith in my ability to do that neatly with fraying polyester fabric! Instead I made up the dress body in lining fabric and stitched it to the fashion fabric dress right sides together along the armscyes, clipping the lining at the ends of the armscyes. After turning and pressing I sewed the yoke to the dress, keeping the linings on both pieces free, and pressed the seams onto the yoke. Finally I stitched in the ditch on the yoke seams, catching the previously pressed under edge of the yoke lining. The dress holds its shape quite well. It could probably be improved by adding something like horsehair braid to the hem. These photos were taken straight after pressing so you’re seeing it at its best. Unusually I didn’t feel the need to take any length off the hem, which makes me think this one comes up very short. I did have to adjust the neckline. As drafted it’s uncomfortably high at the front. I deepened it about 2cm and it’s still a touch too high. I found it very difficult to get the hem level and I’m not sure I succeeded. I aimed to have it level for my normal posture, and you can see here that it makes a considerable difference if I stand slightly straighter. There are a few problems with the fit: the yoke is a little too tight and the side seams are swinging forward, probably because I made no attempt at a full bust adjustment. If I make this again I’ll probably go up a size and make the front skirt pieces longer and wider. But I think this version is good enough to wear. 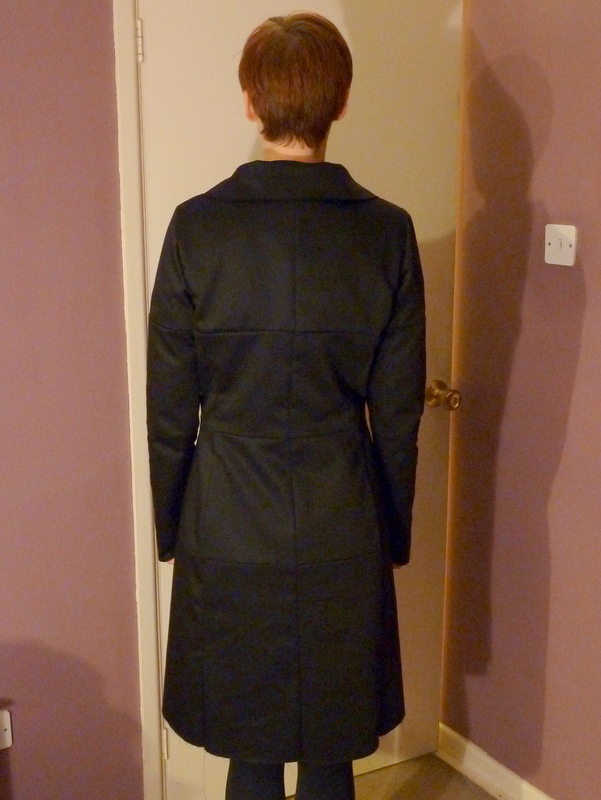 The back is entirely plain but here’s a picture of it anyway. The pattern is not quite as easy to sew as it appears at first sight because of the shoulder zip. Finishing off the lining at the outside shoulder edge on the side with the zip is very fiddly indeed. I had to hand sew a little because I just couldn’t get at the last bits with the machine. I think the shape works ok in practice. I was half-expecting to end up with a dress that I wouldn’t want to wear out of the house. I suspect the key is to keep it short. I wouldn’t rule out making this pattern again some time, although I’ll pick fabric with a lot more body. Ever have the impression you’ve been sewing a lot of duds? This year my productivity has been down and I seem to have produced more failures than usual. Right now I can’t sew at all because I’m in the middle of moving and everything is packed up. So it seems like a good time to try to work out how to improve the hit rate for when I can get at my sewing machines again. Is it that I’m choosing the wrong patterns? The wrong fabric? Or something else? So here are the failures. First of all, Vogue 1317. This really should have worked. 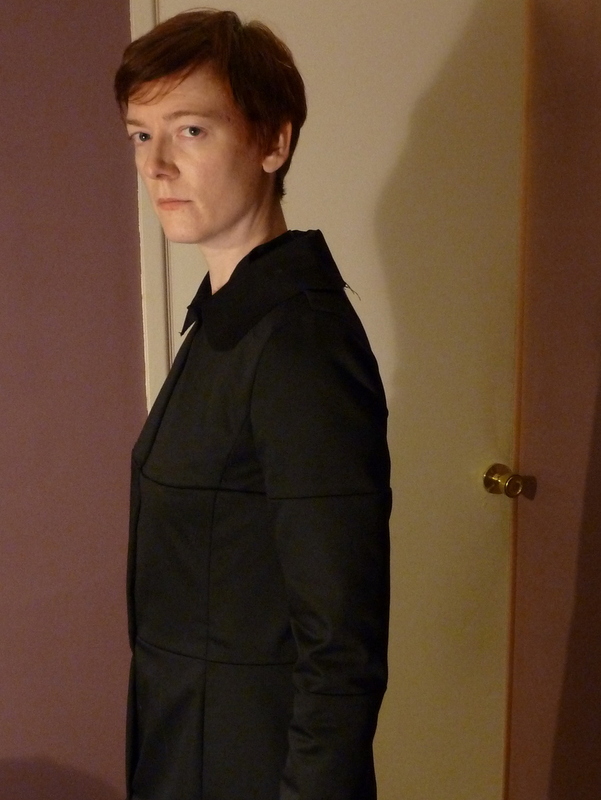 It’s a Chado Ralph Rucci pattern, and the (fake) suede I made it up in has a wonderful texture. However I think I’ve only worn it once or twice. The fit is off, and the sleeves on it are drafted in such a way that you can’t raise your arms. It makes for a great shoulder line but it drives me up the wall when I have the dress on. I bought some more suede to have another go at it, but since then I’ve seen some suede skinny trousers, and they appeal much more than another attempt at this pattern. Burda 134-06-2012 also ought to have worked; horrible fabric choice and sizing problems killed it. I might try this one again at some point though. The fit problems (tight skirt, weird length on the bodice) are easy to fix and there’s always more fabric out there. Again I think it would be better in a knit than the woven I used. Vogue 8825 didn’t even get finished. It’s lurking in a plastic bag right now. I can’t quite bring myself to chuck it out yet, but I know I’m never going to complete it. It’s a beautiful pattern, but the style’s really not me. And then we have two that seemed quite successful at the time, but I haven’t worn as much as I expected. 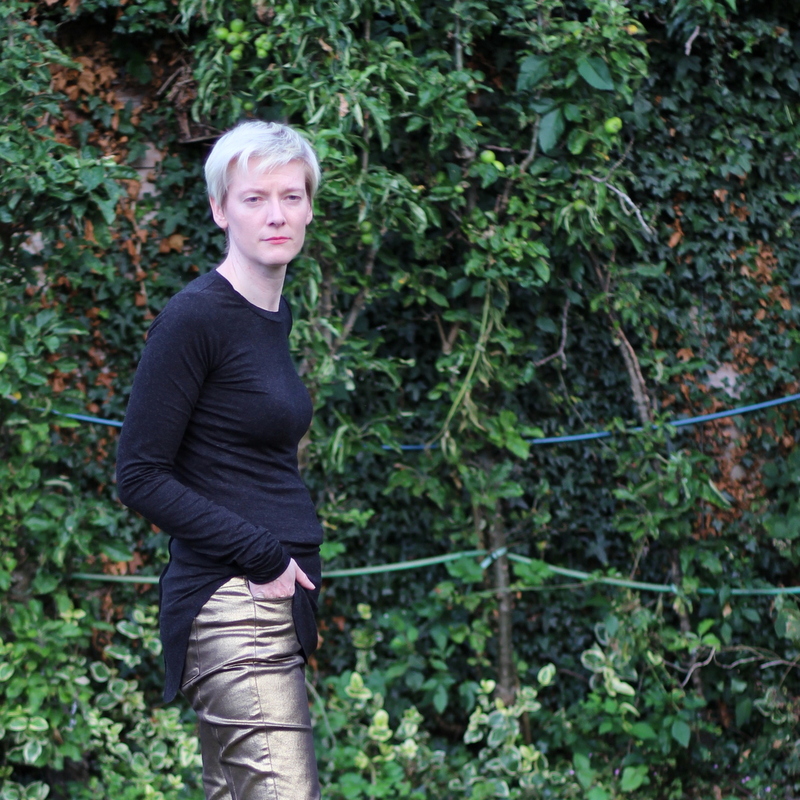 My violet version of Burda 122-09-2010 looks nice, but it’s too tight and short to be entirely comfortable. I love the pattern, and have other versions that were much better; it just needs a fabric with more stretch than this one. The twin needle hem has broken in a few places but I have no desire to make this any shorter by hemming it again. And Vogue 8866 photographs really well…but I rarely find the right occasion to wear it. And again it’s a little too tight. I’ll certainly make it again, but this version really belongs in the dressing up box. So do they have anything in common? With most of them the problem is that they don’t fit. Which makes sense, because I only stopped wearing ready-to-wear because home-made clothes are so much more comfortable. It’s reassuring that the problem is likely to be fixable: it’s not that I’m sewing the wrong things all the time, just the wrong sizes – or the wrong sizes for the chosen fabric anyway. Hopefully once I get my new sewing space into a usable state my hit rate will improve. This dress is made from the most amazing polyester suede fabric. It’s so strokable that every time I put the project down I found myself missing the texture. It comes from Minerva Crafts in a range of colours. It was easy to sew. I needed to use a leather needle but otherwise it was just like any heavy woven. The pattern is Vogue 1317, a recent Chado Ralph Rucci design. Suede is one of the suggested fabrics on the envelope back otherwise I doubt I’d have thought of it. The other suggestion is lightweight doubleknit. Here’s Vogue’s version. I’m not sure which, if either, theirs is made from. Or what the photographer was thinking when asking for that pose from the model. 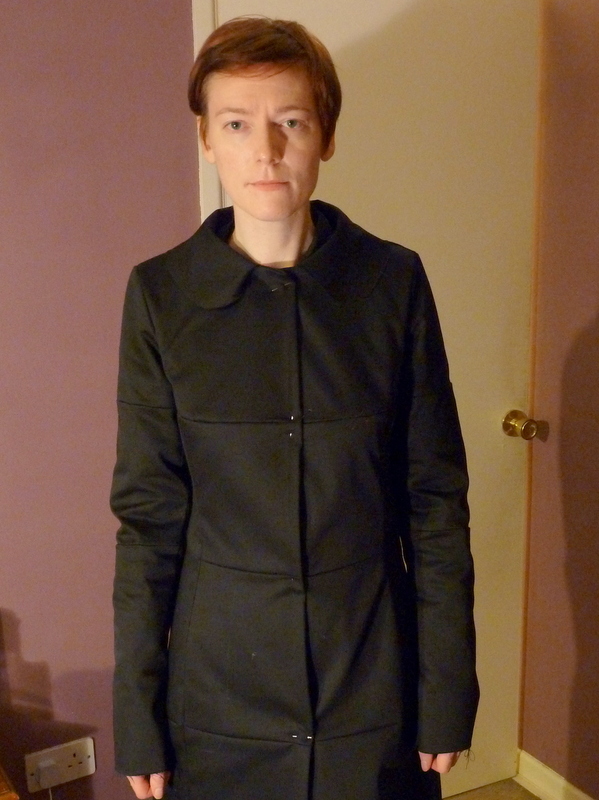 What’s not entirely obvious from either photo is all the top-stitching on this style. There’s a lot: like many of the Chado Ralph Rucci styles almost every seam is edge-stitched and top-stitched. The line art gives some idea of what’s involved. It took me two weeks of serious sewing to complete it all. This is the back gusset seam on my dress. I made an effort with the top-stitching here so it’s fairly even (for me). As the project wore on and on and some major fitting issues become apparent I got a lot more slapdash! Luckily it’s not obvious unless you get very close. Where this dress went wrong is the sizing. I’d read some reviews which said that it came up very small so I checked the finished garment measurements on the pattern carefully and based on those went up a size from my usual Vogue size. Even then I needed to let out almost the whole of the extra wide seam allowance at the centre back seam. You’re supposed to use that extra allowance to do a bias bound finish on the fabric edges without the zip tape getting in the way. As it is those edges are simply zigzagged and very untidy, but at least I can zip the dress up. Either the finished garment measurements are optimistic, I’ve got a lot bigger, or something I did in the processing of the seams has taken out some width. This is about the best picture I’ve got of the back. It looks like I’ve lengthened the bodice a bit too much although I’m sure some of those wrinkles are just from the way I’m standing. I certainly overdid lengthening the sleeves. It has tiny little pockets. They’re slightly bigger than this picture makes them appear but you couldn’t safely put a phone or a lot of keys in them. I don’t think they’re entirely useless though. It’s always good to have somewhere to stash a tissue or some screws you just took out of something and don’t want to lose. Although this hasn’t been a completely successful project I can’t help thinking there’s a really great dress somewhere in this pattern. The shape is lovely and the suede fabric is wonderfully tactile. I’ve got some more polyester suede and I’m going to try again, with a bigger size this time. But first I’ll make something nice and easy, I need a break!